Figure 4-51.Typical smoke pipe (flue) installation. 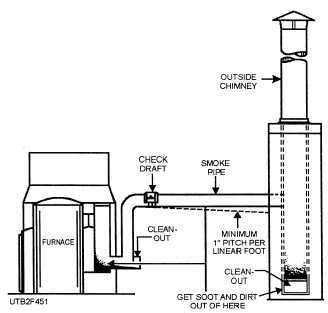 Home > Construction Training Manuals > Utilitiesman Basic Volume 02 > Figure 4-51.Typical Smoke Pipe (Flue) Installation. bolts have been installed, draw each one gradually until all are uniformly and properly tight. Avoid drawing bolts too tight, as this can crack or break a casting or buckle a steel plate. After assembling the furnace, check all doors for free operation and tight fit. Install the downdraft diverters furnished with the equipment on all gas-burning furnaces. Diverters are developed for individual furnaces. Use a vent or smoke pipe that is at least as large as the smoke-pipe outlet of the furnace. Securely fasten the vent or smoke pipe at each joint with a minimum of three sheet metal screws. Install horizontal pipe with a pitch upward of at least l-inch per linear foot (fig. 4-51). Ventilate the furnace room adequately to supply air for combustion. Provide an opening having 1 square inch of free-air area for each 1,000 Btu per hour of furnace input rating with a minimum of 200 square inches. Locate the opening at or near the floor line whenever possible. In addition, provide two louvered openings, each having a free-air area of at least 200 square inches in it, at or near the ceiling as near opposite ends of the furnace room as possible. Tank installation is largely governed by local conditions. Listed here are the principles of tank installation that give greatest freedom from service problems. Adhere as closely to these recom- mendations as local conditions permit. Figure 4-51. - Typical smoke pipe (flue) installation. When possible, install single-pipe gravity oil feed on inside tanks or elevated outside tanks (fig. 4-52). This type of installation is used for single-stage pumps. Use a 1/4-inch globe valve at the tank instead of a larger size. Larger valves sometimes cause tank hum. For all installations, use a continuous piece of 1/2-inch copper tubing from the oil tank or valve to the burner and a similar piece for the return when required. The principle is to minimize the number of joints and thus minimize the possibility of air or oil leaks. For inside installations where it is necessary to run the piping overhead between the tank and burner, when the burner is either above or below the tank level, the two-pipe system is recommended. This requires the use of a two-stage pump. A dual-stage pump may be changed from a single-stage to a two-stage pump to accommodate a single-pipe or two-pipe system. The stages on a Webster fuel pump can be changed by removing the four screws on the pressure side of the pump and lining the Number 1 up with the letter on the pump body for a one-pipe system. The Number 2 lined up with the letter is for a two-pipe system. Most Sunstrand fuel pumps are shipped from the factory set up for a one-pipe system. To change to a two-pipe system, remove the 3/8-inch pipe plug from the bottom of the pump housing. There you will find an Allen head plug. Remove this plug for a two-pipe system. Install the outside tanks (fig. 4-53) according to the instruction below. Normally, when you are installing an underground fuel tank, the suction and return lines are made of black iron from the tank to the inside of the building, and there the burner is connected by copper tubing with a coil in it (not shown in the illustration) to eliminate vibration. The return line is usually installed in the opposite end of the tank. Carry it to within 5 inches of the bottom. This creates an oil seal in the two lines, and any agitation caused by return oil is safely away from the suction line. A 1 1/2-inch fill line and a 1 1/2-inch vent line are recommended. Carry the vent well aboveground and put a weatherproof cap on it. Pitch the vent line down toward the tank.